Are you an Open Sourcerer? 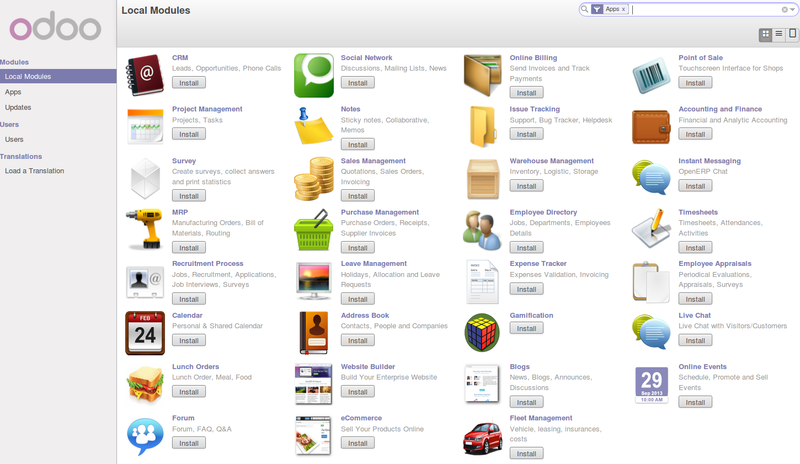 Welcome to the latest of our very popular OpenERP Odoo installation “How Tos”. The new release of Odoo 8.0 is a major upgrade introducing a great many new features and a new name. Rather than me blathering on about what’s new, you can simply just go and read the release notes here. Just one thing before we start: You can simply download a .deb (for Debian/Ubuntu type systems) or a. rpm (Redhat/CentOS) package of OpenERP and install that. Unfortunately that approach doesnâ€™t provide us (Libertus Solutions) with enough fine-grained control over where things get installed, and it restricts our flexibility to modify & customise, hence I prefer to do it a slightly more manual way (this install process below should only take about 10-15 minutes once the host machine has been built). This time, rather than using a source tarball as the basis for installation we are going to take the code straight from the Odoo 8.0 branch on Github. This should help when it comes to installing updates and bug fixes in the future by being able to issue a git pull command to update the code. Bear in mind before doing a pull request you should always have backups and you may need to update your Odoo database(s) as well. I install just the bare minimum from the install routine (you may want to install the openssh-server during the install procedure or install subsequently depending on your needs). UPDATE: Note that it seems denyhosts is no longer being maintained and is not in the main Ubuntu repository any more. I’m aware of a possibly suitable alternative called fail2ban but have not used it yet; do you own research. Thanks to Rami for the cluebat! UPDATE2: Thanks to Paul for the pointer. I have added python-unicodecsv to the list of dependencies. Apparently this is required to correctly restore backups. Although not always essential itâ€™s probably a good idea to reboot your server now and make sure it all comes back up and you can login via ssh. Now weâ€™re ready to start the Odoo install. This is a â€œsystemâ€ user. It is there to own and run the application, it isnâ€™t supposed to be a person type user with a login etc. In Ubuntu, a system user gets a UID below 1000, has no shell (itâ€™s actually /bin/false) and has logins disabled. Note that Iâ€™ve specified a â€œhomeâ€ of /opt/odoo, this is where the OpenERP server code will reside and is created automatically by the command above. The location of the server code is your choice of course, but be aware that some of the instructions and configuration files below may need to be altered if you decide to install to a different location. This will su your current terminal login to the odoo user (the “-” between su and odoo is correct) and use the shell /bin/bash. When this command is run you will be in odoo’s home directory: /opt/odoo. When you have done what you need you can leave the odoo user’s shell by typing exit. First change to the postgres user so we have the necessary privileges to configure the database. With that done, all the dependencies for installing Odoo 8.0 are now satisfied (note that there are some changes between this and the packages required for OpenERP 7.0). UPDATE & NOTE: It has been pointed out to me that the Qweb templating engine in Odoo 8 is warning that the version of wkhtmltopdf is too old. It turns out that Ubuntu 14.04 packages version 0.9.9 of this library even though this is rather old. To update your Ubuntu server please follow the instructions on this page. Many thanks to Ruben Kannan for pointing this out :-). UPDATE & NOTE II: Zak suggests an alternative method to get and install the most recent version of wkhtmltopdf in this comment below. Thanks Zak. UPDATE & NOTE III: David suggested adding python-cups and python-geoip to the list of modules to install in this comment below. Thanks David. git clone https://www.github.com/odoo/odoo --depth 1 --branch 8.0 --single-branch . Note: Thanks to Ian Beardslee for the cluebat. Have now added --depth 1 to the command so it only retrieves the latest version without all the history. The download is now quite a bit quicker. Once it’s finished exit from the odoo user: exit. The above commands make the file owned and writeable only by the odoo user and group and only readable by odoo and root. To allow the odoo server to run initially, you should only need to change two lines in this file. Toward to the top of the file change the line db_password = False to the same password you used back in step 3. Then modify the line addons_path = /usr/lib/python2.7/dist-packages/openerp/addons so that it reads addons_path = /opt/odoo/addons instead. Use your favourite text editor here. I tend to use nano, e.g. Once the configuration file is edited and saved, you can start the server just to check if it actually runs. If you end up with a few lines eventually saying OpenERP (Yes. The log still says OpenERP and not Odoo) is running and waiting for connections then you are all set. If there are errors, you’ll need to go back and find out where the problem is. Otherwise simply enter CTL+C to stop the server and then exit to leave the openerp user account and go back to your own shell. For the final step we need to install a script which will be used to start-up and shut down the server automatically and also run the application as the correct user. There is a script you can use in /opt/odoo/debian/init but this will need a few small modifications to work with the system installed the way I have described above. 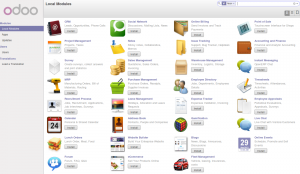 Hereâ€™s a link to the one Iâ€™ve already modified for Odoo version 8. You should now be able to view the logfile and see that the server has started. What I do recommend you do at this point is to change the super admin password to something nice and strong (Click the “Password” menu). By default this password is just “admin” and knowing that, a user can create, backup, restore and drop databases! This password is stored in plain text in the /etc/odoo-server.conf file; hence why we restricted access to just odoo and root. When you change and save the new password the /etc/odoo-server.conf file will be re-written and will have a lot more options in it. Check the log file again to make sure it has stopped and/or look at your serverâ€™s process list. You can now try rebooting you server if you like. Odoo should be running by the time you log back in. Which shows that the server is running. And of course you can check the logfile or visit the server from your web browser too. That’s it! Next I would suggest you create a new database filling in the fields as desired. 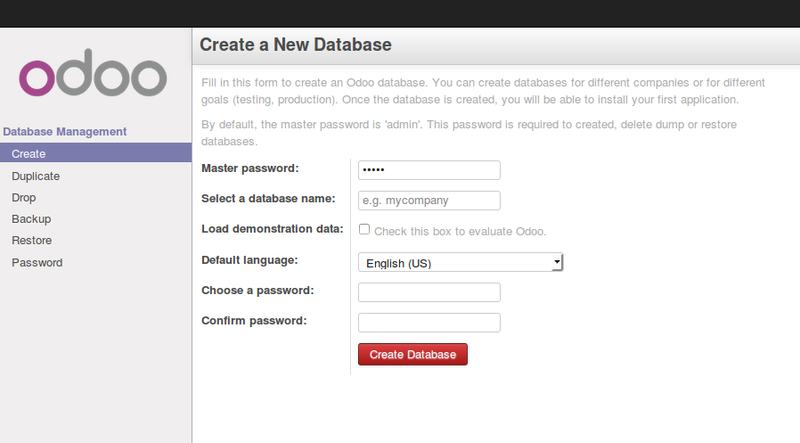 Once the database is initialised, you will be directed straight to the new main configuration screen which gives you a feel for the new User Interface in Odoo 8 and shows you how easy it is to set up a basic system. 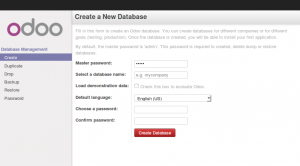 September 19th, 2014 | Alan Lord | Tags: Odoo, OpenERP, PostgreSQL, Ubuntu. After several months of development the latest version of the most popular open source CRM, vtiger CRM is released today. vtiger 6.1.0 provides new features, over 150 bug fixes and support for newer versions of PHP and MySQL, as well as the new all Extension Store & vtiger Marketplace where our own Geographic Information System extension, GeoTools, was the first to be approved and published. Release notes for vtiger are here. As always, the UK’s most experienced vtiger partner Libertus Solutions is available for support and assistance with any vtiger implementation. 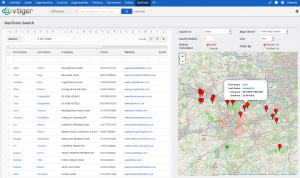 September 16th, 2014 | Alan Lord | Tags: CRM, Geolocation, Open Source, vtiger. Remember our first release of GeoTools? Libertus Solutions are delighted to announce the release of a completely re-written GIS (Geographical Information System) extension module for the soon-to-be-released vtiger 6.1.0. 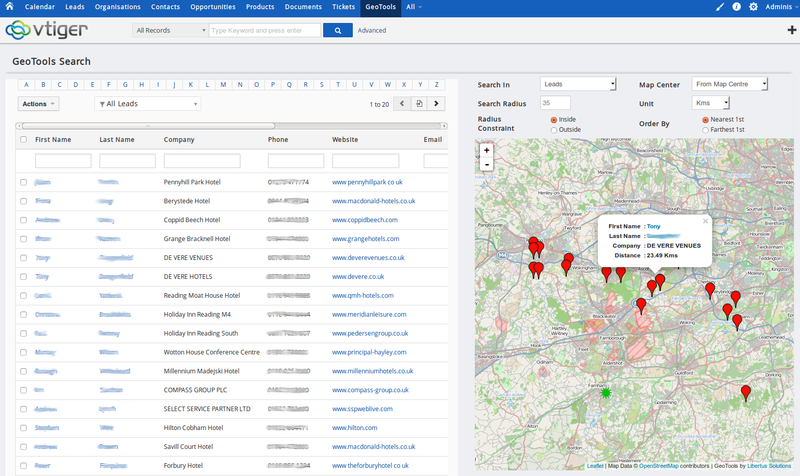 This new version of GeoTools integrates services from OpenStreetMap with whatever business data is configured and available in your CRM application. GeoTools is the first new extension module to be approved and published in vtiger’s new Marketplace and offers a host of new features that take full advantage of the new MVC architecture of vtiger 6. This version of GeoTools has been totally re-written from the ground up. We fixed a few bad design decisions that kind of “just happened” in the first version and have re-architected the internal Geocoding and Tile service APIs so these are now vendor agnostic. In the first GeoTools release we used the Google Maps API for both Tile and Geocoding services but these are now subject to terms & conditions which are probably not appropriate for the majority of businesses that would wish to use GeoTools. Consequently, this release now uses services from OpenStreetMap but other services from commercial vendors could just as easily be supported too; such as Google or MapQuest or MapBox. We used the amazing Leaflet JS library to handle the majority of the mapping user interface. It’s a pleasure to use, well documented and is highly featured. 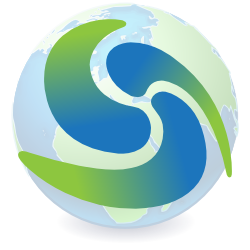 GeoTools is Open Source Software. We decided however to sell the extension via vtiger’s Marketplace for a nominal fee as we have spent considerable effort developing this product and believe it represents great value for money. Installation from the vtiger marketplace is a 1-click affair and we will provide support to paying customers. The GeoTools code will be available shortly on the vtiger forge but users will be on their own in terms of installation and support. There isn’t a straightforward upgrade path between the version of GeoTools for vtiger 5.4.0 and this release unfortunately, although it should be possible to do for customers who have a large amount of data they’d rather not have to re-geocode. If you are interested in migrating please contact Libertus Solutions directly. September 4th, 2014 | Alan Lord | Tags: CRM, Geolocation, vtiger. Being a family man and a geek, our household has both children and lots of tech; there are 6 or so computers, various tablets, smartphones and other devices capable of connecting to, and displaying content from, the Internet. If the ISP’s filter prevents access to content which we feel that our kids should be able access, how can I change that? Essentially I can’t. I reckon that most kids of mid-teenage years will have worked out ways to bypass these filters anyway (see footnote) leaving more naive parents in blissful ignorance; thinking their kids are protected when in fact they are not. Firstly this is how our networked looked before. 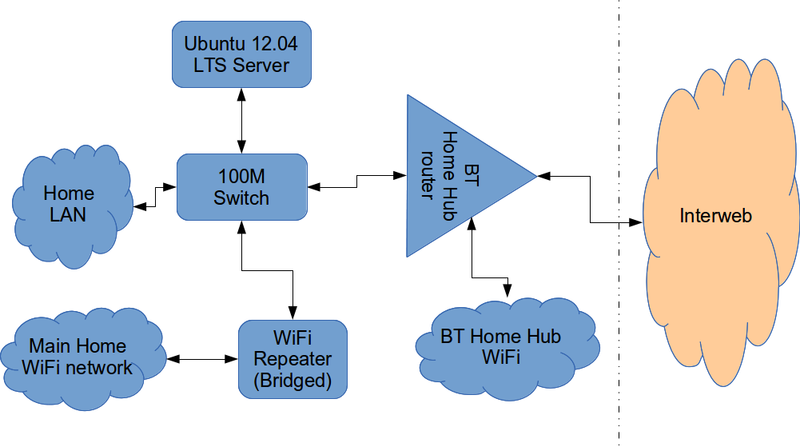 The BT Router is providing the DHCP service in the above diagram. The Ubuntu 12.04 Server is called vimes (after Commander Vimes in the Discworld novels by Terry Pratchett) and is still running the same hardware that I described way back in 2007! It’s a low power VIA C7 processor, 1G of RAM and it now has a couple of Terabytes of disk. It’s mainly used as a central backup controller and dlna media store/server for the house. I never did get Untangle working on it, but now it seemed like a good device to use to do some filtering… There are loads of instructions on the Internet about using Squid & Dansguardian but none covered quite what I wanted to achieve: A dhcp serving, bridging, transparent proxy content filter. As you can see above, the physical change is rather negligible. The Ubuntu server now sits between the home LAN and the broadband router rather than as just another network node on the LAN as it was before. The configuration of the server to provide what I required can be broken down into several steps. Probably the most interesting part of this file is where we assign a static IP address to the bridge itself. Without this I would not be able to connect to this server as both ethernet ports are now just transparent bridge ports so not actually listening for IP traffic at all. The reason for this is mostly down to the BT Home Hub… For some bizarre reason, BT determined that they should control what DNS servers you can use. 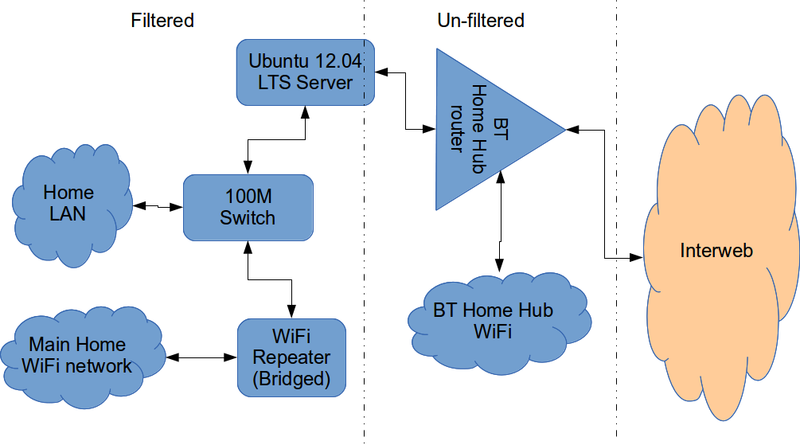 Although I’m not using it right now, I might choose to use OpenDNS for example, but I can’t change the DNS addresses served by the BT Home Hub router so the only way I can control this is to turn off DHCP on the router altogether and do it myself. Tell the dhcp server to listen for requests on the bridge port we created before by editing the file /etc/default/isc-dchp-server so that the INTERFACES line reads: INTERFACES="br0". There are many options and choices to make regarding setting up your DHCP server. It is extremely flexible; you will probably need to consult the man pages and other on-line resources to determine what is best for you. Mine is very simple. It serves one block of IP addresses within the range 192.168.1.16 to 192.168.1.254 to all devices. Currently I’m using Google’s DNS servers but as you can see I’ve also added OpenDNS as a comment so I can try it later if I want to. This bit took a while to get right but, as with most things it seems to me, in the end the actual configuration is fairly straightforward. Install Squid: sudo apt-get install squid. To actually cause all the traffic on our LAN to go through the proxy rather than just passing through the bridge transparently requires a bit of configuration on the server using ebtables to allow easier configuration of the Linux kernel’s bridge & iptables to redirect particular TCP/IP ports to the proxy. My very simplistic understanding of the following command is that it essentially tells the bridge to identify IP traffic for port 80 (http) and pass this up to the kernel’s IP stack for further processing (routing) which we then use iptables to handle. At this point http browser traffic should now be passing through your bridge and squid proxy before going on to the router and Internet. You can test to see if it is working by tailing the squid access.log file. This made an immediate and noticeable difference to the performance; enough so in fact that I haven’t yet bothered to go any further with tuning investigations. Thanks to the author Tony at last.fm for the suggestions. sudo apt-get install dansguardian is all you need to install the application. To get it to work with our proxy I needed to make a couple of changes to the configuration file /etc/dansguardian/dansguardian.conf. First, remove or comment out the line at the top that reads UNCONFIGURED - Please remove this line after configuration I just prefixed it with a #. As you will see in that file, there are loads of other configuration options for Dansguardian and I will leave it up to the reader to investigate these at their leisure. One suggestion I came across on my wanderings around the Interwebs was to grab a copy of one of the large collections of blacklisted sites records and install these into /etc/dansguardian/blacklists/. I used the one linked to from the Dansguardian website here http://urlblacklist.com/ which says it is OK to download once for free. As I understand it, having a list of blacklist sites will reduce the need for Dansguardian to parse every url or all content but this shouldn’t be relied on as the only mechanism as obviously the blacklist will get out-of-date pretty quickly. Dansguardian has configurable lists of “phrases” and “weights” that you can tailor to suit your needs. Now that’s installed we need to go back and reconfigure one of the iptables rules so that traffic is routed to Dansguardian rather than straight to Squid first and also enable communication between Squid and Dansguardian. You can flush (empty) the existing iptables rules by running iptables -F.
Restart Squid and Dansguardian: sudo service squid3 restart & sudo service dansguardian restart. Now if you try to connect to the internet from behind the server your requests should be passed through Dansguardian and Squid automatically. If you try and visit something that is inappropriate your request should be blocked. If it all seems to be working OK then I suggest making your ebtables and iptables rules permanent so they are restored after a reboot. This can be achieved easily for iptables by simply running sudo iptables-save. I followed these very helpful instructions to achieve a similar thing for the ebtables rule. Be aware that on the network diagrams above the Wifi service provided by the BT Homehub router, and the LAN on the router side of the server, are not protected by these instructions. For me this is fine as the coverage of that Wifi network only makes it as far as the Kitchen anyway. And if it was more visible I could always change the key and only let my wife and I have access. Also, I should make it clear that I know what I have above is not foolproof. I am completely aware that filtering/monitoring encrypted traffic is virtually impossible and there are plenty of services available that provide ways to circumvent what I have here. But I am also not naive and I reckon that if my kids have understood enough about networking and protocols etc. to be able to use tunnelling proxies or VPN services then they are probably mature enough to decide for themselves what they want to look at. Of course there are plenty of additional mechanisms one can put in place if desired. April 29th, 2014 | Alan Lord | Tags: Content Filter, Dansgurdian, Discworld, Google, Linux, low power server, OpenDNS, Proxy, Server, Squid, Terry Pratchett, Ubuntu. No doubt by now you will have seen loads of stuff in the media about the Heartbleed bug. This is a pretty bad bug, there have been other huge bugs in the past too, but this one has a very media friendly name and a cute logo so it gets the coverage that it deserves. In short it affects https connections to web servers and other types of server that use ssl in a less obvious way. We have been updating and fixing servers that we host but we know that rather a lot of people have been using our guides to installing OpenERP, if you have, and you set up the https connections to the server (part 2 of the guides), then you are probably vulnerable to the heartbleed bug. OpenERP itself does not do the https bit, we used either Apache or Nginx as a reverse proxy to add the ssl layer. and then restart your webserver service, which could be apache or nginx, if you can’t remember which then just try both, one will fail with an unrecognised service error. Now useÂ http://filippo.io/Heartbleed again to confirm that you are fixed. If you are not using https you might be fine, you have an inherently less secure connection to your server, but the server won’t serve up it’s memory to anyone who asks for it. Even if you are not using https right now, do update anyway, it is a good thing to do. Ubuntu and Privacy and how it really works now. There have been quite a few entertaining discussions on the interwebs about Ubuntu and concerns around privacy. This topic comes and goes on a regular basis, today it has come up because Mozilla are planning on putting some fairly harmless adverts on the blank tiles of new tabs and this is being compared to the Dash search in Ubuntu. Whenever the topic is raised it tends to be a fairly heated discussion, mostly focussing on the Amazon search results in the dash, mostly calling that adverts or spyware. It is a discussion that is mostly overblown and underinformed, with so much time spent freaking out about “adverts” that the real problems have been completely missed. Lets go through a bit of history, and I will try and explain the difference between the real problems and the FUD. Initially there was the Gnome 2 application launcher, kinda similar to the Windows start button, it is a way to run applications that you have on your computer. They are nicely categorised so you can find all the graphics related applications on your computer and see Inkscape alongside Gimp and choose what you want to run. This worked well and people were generally satisfied at this mechanism for running local applications. Then along came Unity, this introduced the launcher, a dock bar on the left that shows running applications and has the ability to pin applications so you can start them by clicking on them when they are not running. The launcher is the way to run applications that you have on your computer – but not all of them, and not categorised, just your favourite ones you have pinned to the launcher. Unity also introduced the dash. This has a different scope of functionality, I like to call it the OmniGlobalEverywhere search tool. You type stuff in and it searches in lots of places to find what it is you are looking for. This is not the same scope of functionality as the Gnome 2 application launcher, it could search for local files, videos on YouTube and other streaming services, music, photos, other things. It is an extensible search interface and you can plug in additional search things. I wrote an OpenERP plugin so I could type an invoice number and jump straight to that invoice in a browser for example. It was a pretty cool concept as a jack of all trades search interface – but it isn’t the master of the specialised job of viewing and running applications you have already got installed. Everyone completely missed the fact that the magic privacy button for a long time did almost nothing – it was just an undocumented flag that some lenses looked at and turned themselves off. Others did not. This was a real big deal and nobody noticed because they were obsessed with calling Amazon search results adverts. Now we have all kinds of odd lenses and search queries possibly going to yelp, zotero, yahoo finance, songster, songkick, gallica, europeana, etsy, COLORlovers and other places. Have you even heard of every single one of these? Do you know they are not evil? Do you know they are financially stable enough not to close the doors and let the domain renewal lapse for someone evil to buy it? Amazon I know and trust to continue existing, I also trust them not to want searches for partial mostly irrelevant words for profiling data when they have my product purchase history. The utter junk that the dash sends is of no value to Amazon compared to everything else they have, but this doesn’t stop people banging on about that one specific, relatively harmless and pointless in equal measure lense. Firstly the Amazon lens is nothing special, and it is perhaps the internet connected lens I am least worried about. I trust Amazon to do what I expect them to do, I am a customer so they know what I bought, sending them random strings like “calcul” and “gedi” and “eclip” does not give them valuable data. It is junk. I am much more concerned about stuff like the Europeana, jstor, grooveshark lenses which do exactly the same thing but I have no idea who those organisations are or what they do. Even things like openweathermap, sounds good, but are they really a trusted organisation? So, back to how it works. Your query for “socks” goes to products.ubuntu.com. At that point canonical’s secret sauce server looks at your query and decides that most people who search for socks either want to know about products to buy, or applications to run. They don’t tend to click on the results from the medicines or recipes lenses when we try showing those lenses to the user. So, having decided that the shopping lens and the applications lens are reasonable ones to search in it sends the query to Amazon (being the only shop currently supported, but it is designed to support every online sock vendor in the world) and tells your computer that the applications lens is worth looking in. When it gets the results back from Amazon those go to your computer, as a bunch of json data that is very similar to the Amazon json API, Amazon at this point thinks that Canonical’s server has got cold toes and is in need of some nice warm socks. Amazon does not know you exist at this stage. That bundle of sock related data goes to the shopping lens on your computer, which then displays the results. It does this by showing some text “stripy socks, only Â£5.30” and a picture, which it used to retrieve from Amazons content distribution network – O.M.G.!!! a data privacy leak. Amazon could log hits to their CDN (which I doubt they do), consolidate them globally, and figure out that it was displaying a bunch of sock pictures requested by your IP address, shortly after Canonical’s server searched for socks, so they could theoretically tie this together and infer that the reason you are staring at sock pictures is because you searched for socks via the dash search tool. So this huge and seriously concerning data privacy breach was a problem, so they fixed it. Now when you search for socks, Amazon gets CDN requests for images from products.ubuntu.com. Your computer gets the images from products.ubuntu.com (over https rather than http), it is now basically a reverse proxy for Amazon images, so that amazon is now more convinced than ever that Canonical’s server has got cold toes. As it happens, there is nothing wrong with your toes and you actually wanted to configure a socks proxy all along, and the shopping thing was a pointless overhead because when you want new socks the dash isn’t where you dash to. The content of this website is licensed under a Creative Commons Attribution-Share Alike 3.0 License.